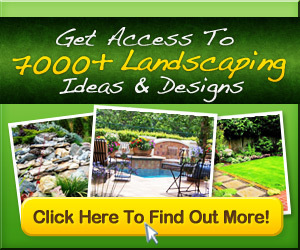 The best landscaping ideas, for front yard or backyard usually come for free. No matter where you live anyone can make their their landscaping look like a professional architect was called in. Imagination, not skill will make the landscape of your dreams happen! Now it’s time to get your hands dirty! Although many ideas for you garden may come for free – Time and planning will move the idea to reality. Lay out your ideas, thoughts and dreams on paper. Take your time and think about what you are looking for in your yard – a desert landscape, rock or flower garden? Does a swimming pool come into play? How about lighting, the daytime light and accent lighting for night time? 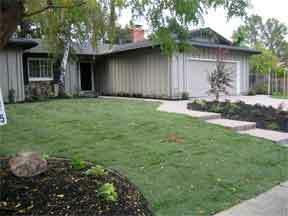 For starters, begin any front yard garden plans around large unmovable items like trees and outside buildings. Make these unmovables fit in with your garden design. One of the fastest ways to get inspiration and ideas is by taking a drive. Look at your neighborhood, what are the neighbors doing, jot down the things you like. Don’t forget to take the digital camera! Snap a quick pictures of front yard landscaping ideas you may consider incorporating into your plan. A picture is a great way to visualize the idea and concept in your own frontyard. Picking up some magazines can also provide ideas as well as some of the home improvement shows. In choosing the right materials, first look at how much space you have to work with. How big is that landscape canvas? Are you decorating a front porch, a small patio or a large open area. This can dictate plant material and sizes. When you drive around the neighborhood looking at landscapes make note of the type of plant materials used. When you’re selecting plants, do you want your design to use unique materials of plants and rocks? Does the space receive full or part sun? Do you have an area that receives only shade and no sun at all? Are there any landscape drainage or watering issues? What kind of irrigation is available? You want to select plants which will perform well in the conditions you plant them in – maybe go with native materials. There are all sorts of materials beside plants to make your landscape shine! Artificial walls, borders, ponds, waterfalls, benches and statues can all spice up your design. Use lumber, railroad ties, cement blocks, stones, rocks or boulders to add layers to a flat landscape or emphasize the beauty of an existing berm or sloped area. Creative ideas do not cost a lot and anyone can do it. Whatever the landscape design, utilizing plants, shrubs, lumber or stone, make sure you have the tools and knowledge to maintain the design. If your landscape includes plants and flowers, feed and water them accordingly. Don’t waste your time and efforts by watching your plants turn brown or dying off. With a little creative imagination, effort and hard work, your new landscaped front or backyard will be appreciated and enjoyed for many years – plus it will increase the property value! Plus, maybe someone else will be doing their own front yard makeovers and use the ideas from your landscaping design to use in theirs.